Permafrost, or permanently frozen ground, is soil, sediment, or rock that remains at or below 0°C for at least two years. It occurs both on land and beneath offshore Arctic continental shelves, and its thickness ranges from less than 1 meter to greater than 1,000 meters. Seasonally frozen ground is near-surface soil that freezes for more than 15 days per year. Intermittently frozen ground is near-surface soil that freezes from one to 15 days per year. Frozen ground data are critical to understanding environmental change, validating models, and building and maintaining structures in seasonal frost and permafrost regions. Climate models and observations have both pointed to likely permafrost thawing in the 21st century. Permafrost regions occupy approximately 22.79 million square kilometers (about 24 percent of the exposed land surface) of the Northern Hemisphere (Zhang et al. 2003b). Permafrost occurs as far north as 84°N in northern Greenland, and as far south as 26°N in the Himalayas. Because reliable data on hemispheric-scale permafrost extent have only recently become available, this site provides just a snapshot of current permafrost conditions rather than time-series data. Permafrost map: Darker shades of purple indicate higher percentages of permanently frozen ground. Map courtesy Philippe Rekacewicz, UNEP/GRID-Arendal; data from International Permafrost Association, 1998. Circumpolar Active-Layer Permafrost System (CAPS), version 1.0. Exactly what is permafrost? Permafrost is not defined by soil moisture content, overlying snow cover, or location; it is defined solely by temperature. Any rock or soil remaining at or below 0°C for two or more years is permafrost. It can contain over 30 percent ice, or practically no ice at all. It can be overlain by several meters of snow, or little or no snow. Understanding permafrost is not only important to civil engineering and architecture, it is also a crucial part of studying global change and protecting the environment in cold regions. In terms of area, permafrost can be characterized as continuous, discontinuous, sporadic, or isolated, but because these are descriptive terms, the boundaries separating different permafrost zones can be vague (Zhang 2005). Determining the location and extent of permafrost is often difficult. The historical approach has been to assume that ground temperature equals the overlying air temperature, but ground and air temperatures usually differ. Even in areas where the mean annual air temperature is below freezing, permafrost may not exist. Land under glaciers, rivers, and streams is often free of permafrost, despite freezing air temperatures at the surface (Williams and Smith 1989). Geologists and geocryologists have mapped permafrost since the mid-20th century. In 1990, the International Permafrost Association (IPA) recognized the need for a single, unified map to summarize the distribution and properties of permafrost and ground ice in the Northern Hemisphere. The IPA map shows the distribution of permafrost and ground ice for the continental land masses, areas of mountain and plateau permafrost, sub-sea and relict permafrost, relative abundance of ice wedges, massive ice bodies and pingos, and for ranges of permafrost temperature and thickness (Brown et al. 1998). Most permafrost in the Northern Hemisphere occurs between latitudes of 60°N and 68°N. (North of 67°N, permafrost declines sharply, as the exposed land surface gives way to the Arctic Ocean.) There is also a significant amount of permafrost around 35°N, in the Qinghai-Xizang (Tibet) Plateau, and in the mountains of southwest Asia and the U.S. Rocky Mountains. About 37 percent of Northern Hemisphere permafrost occurs in western North America, mainly in Alaska and northern Canada between 165°W and 60°W. Most permafrost occurs in the Eastern Hemisphere, mainly in Siberia and the Far East of Russia, northern Mongolia, northeastern China, the Qinghai-Xizang (Tibet) Plateau, and surrounding mountains between 60°E and 180°E (Zhang et al. 1999). Proximity to large water bodies tends to reduce temperature extremes, which affects the distribution of permafrost. Scandinavia and Iceland, for instance, have relatively little permafrost (Williams and Smith 1989). Snow cover can play a varying role in the formation or survival of permafrost. In areas of continuous permafrost, seasonal snow cover can lead to warmer ground temperatures, while in areas of discontinuous or sporadic permafrost, the absence of snow cover can contribute to permafrost formation (Zhang 2005). Permafrost area: Variations of the permafrost area (solid line), its fraction (short dashed line) of the land surface at each latitude, and the accumulated fraction with latitude (long dashed line) in the Northern Hemisphere. Image by Tingjun Zhang, National Snow and Ice Data Center, University of Colorado, Boulder. 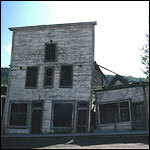 Building damage: Not long after their construction, these buildings in Dawson City, Canada, had to be abandoned. Poorly engineered buildings can accelerate permafrost thaw by trapping heat, leading to their own destruction. Image courtesy Andrew Slater, National Snow and Ice Data Center, University of Colorado, Boulder. Despite its name, permafrost is characterized by its instability. It is often covered by an active layer that regularly melts. Although permafrost can be thousands of years old, it is sometimes newly formed or about to thaw, and it often exists close to its melting point (Williams and Smith 1989). As permafrost thaws, it jeopardizes both man-made structures and natural features. Thawing permafrost on mountain slopes can lead to landslides (Nelson et al. 2001). Approximately 55 percent of the Northern Hemisphere's land surface is covered by seasonally frozen ground, which can last for a few weeks in the middle and lower latitudes, and for several months at high latitudes and high elevations (Zhang et al. 2003a). Drunken forest: Permafrost thaw under forest can lead to tilting trees. Creative Commons license by Lynn D. Rosentrater, some rights reserved. Both model projections and observations have indicated permafrost degradation. A permafrost projection published in 2005 using the Community Climate System Model, version 3 (CCSM3) suggested that by 2100, as little as 1.0 million square kilometers of near-surface permafrost might remain, increasing the freshwater discharge into the Arctic Ocean by 28 percent (Lawrence and Slater 2005). This projection applied only to the top few meters of permafrost, and depended upon climate and snow cover models. Field observations indicate that permafrost warmed by up to 6°C during the 20th century. Observations on Svalbard detected extreme permafrost warming during the winter-spring 2005-2006. The thaw apparently resulted from a temperature anomaly where January and April temperatures reached more than 12°C above the 1961-1990 average. These temperature anomalies were within the range of warming scenarios predicted for the late 21st century (Isaksen et al. 2007). Observations in Alaska found permafrost warming at most sites north of the Brooks Range from the Chukchi Sea to the border with Canada, coincident with statewide air-temperature warming beginning in 1976. The warming occurred primarily in the winter, with little summertime change (Osterkamp 2007). Coastal erosion: Intact permafrost is extremely strong and resistant to erosion, and intact sea ice minimizes wave action in the ocean. When sea ice retreats and permafrost degrades, coastlines become much more vulnerable to erosion. These pictures were taken in Shishmaref, Alaska, during a storm in 2003. Only two hours separate the first photo from the second. For reference, red arrows mark the barrel. By the time the second photograph was taken, the coastline in the foreground had retreated past the barrel. Although coastal erosion was significant, this was not a particularly strong storm. Image courtesy Tony Weyiouanna, Sr.
Much of the Northern Hemisphere frozen ground is overlain by evergreen boreal forest. These boreal forests comprise both a source and a sink of carbon. In fact, the Arctic contains nearly one-third of the Earth's stored soil carbon. If the high northern latitudes were to have a significant temperature increase, the regional soils would begin to release carbon into the atmosphere, which could lead to higher temperatures, fueling the cycle of carbon release and temperature rise (Environmental News Network 1999 and Goulden et al. 1998, Schaefer et al. 2011). Photosynthesis consumes carbon dioxide, so a greater supply of carbon dioxide has the potential to boost plant productivity, particularly with extended growing seasons and shrinking permafrost in the Arctic. Some climate projection studies suggest that carbon dioxide released by thawing permafrost will be at least partially offset by increases in productivity of Arctic plants and boreal forests. But unlike model projections, a survey of 98 permafrost-region experts concluded that plants will not come to the rescue. Water stress will hamper plant growth, and wildfires may cause a four-fold increase of carbon release into the atmosphere. As a result, Earth's permafrost regions will likely become a carbon source (rather than a carbon sink) by 2100 (Abbott et al. 2016). Besides carbon dioxide, permafrost thaw can release methane from high-latitude soils. Methane is a much more potent greenhouse gas than carbon dioxide, although it does not remain in Earth's atmosphere as long. Identifying current permafrost extent—and forecasting future extent—is difficult. Satellite sensors cannot definitively identify permafrost, and climate-model-based predictions offer a wide range of values because of the inherent difficulties in simulating cold-region processes. A conservative interpretation of current models suggest that, under RCP 8.5, sustainable permafrost will likely persist only in the Canadian Archipelago, the Arctic coast of Russia, and the uplands of Siberia (Slater and Lawrence 2013).